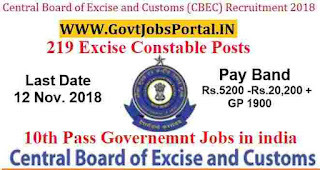 Here is the new opportunity for 10th Pass Government jobs in India for Excise constable posts. Sub-Ordinate Staff Selection Commission introduce a notification on the behalf of EXCISE Department for the recruitment of Excise Constable Posts. OSSSC Recruitment is inviting all fresher Indian candidates to apply for these Excise Department jobs 2018. We took this information from the PDF shared by the department on their official website. In the PDF file they said that they are going to filled up the vacant positions of Excise constable posts. There are total 219 vacant positions which are going to filled up through the OSSSC Recruitment process 2018. 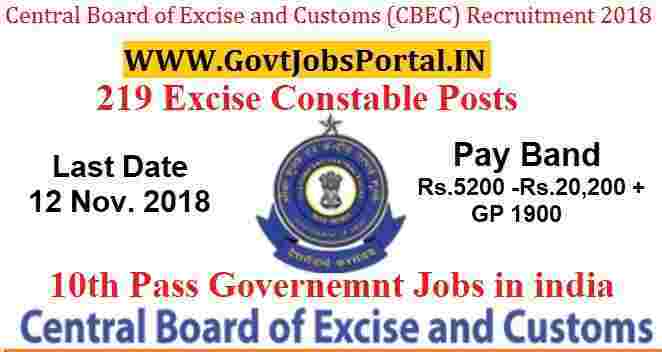 Applicants who are interested in these Government for Excise constable posts can apply online for this OSSSC Recruitment 2018. More information related to these Government jobs in India is given below in this article. The article contains the information related to the eligibility criteria , process for applying, selection process and other conditions related to these Excise department recruitment 2018. So read the whole article very carefully below before applying online. Pay Band: Rs.5200 -Rs.20,200 + GP 1900 per Month. Education: Indian candidates can only apply for these Government jobs. Those who have passed in their 10th class examination from any recognized education board can apply for this OSSSC Recruitment 2018. Age Bond: All applicants who are wishing to apply must have age in between 21 years to 32 years for applying these Government jobs. Pay Examination fee through Online or Challan. 12TH Oct. 2018 is the Opening Date to apply. Candidates who have passed in the 10th class and also satisfied age criteria can apply for this Excise department recruitment through ONLINE process. Above under IMPORTANT LINK section we share the Link for online application form. The link for applying online for these 10th pass Government jobs in India will be live on 12th Oct. 2018 and the Link will remain activated up to 12th Nov. 2018. All eligible candidates have to apply online between these dates.